The Villa Ilissia, which nowadays houses the Byzantine and Christian Museum, is one of the loveliest buildings erected in Athens during its early years as capital of the newly-founded Greek State. When Athens was officially declared the capital, in 1834, it was a town of some 7000 souls. Within two years, however, its population had doubled, as the new administrative authorities were installed here and many new inhabitants arrived from all over Greece and other countries too. Noteworthy among the incomers were Greek and Bavarian civil servants, European philhellenes and devotees of the East, Phanariots and other educated Greeks from abroad, veterans of the War of Independence, and community leaders from the provinces, merchants, entrepreneurs and bankers, together with ordinary folk from all parts of Greece, who flocked to Athens seeking employ or simply a better life. From 1837, among the newcomers to the city was Sophie de Marbois-Lebrun, Duchess of Plaisance. Sophie de Marbois was born in the American city of Philadelphia, in 1785, daughter of the French statesman and diplomat Marquis François Barbé de Marbois and his American wife Elisabeth, daughter of the Governor of Pennsylvania, William Moore. She married Charles Lebrun, son of the co-consul of Napoleon and Duke of Plaisance (or Piacenza). At the time of their marriage, Sophie’s husband was adjutant to Napoleon and the young Duchess distinguished herself at the imperial court by virtue of her beauty and intelligence. The marriage, however, was not a particularly happy one. The Duchess lived apart from her husband, with their daughter, and in 1830, rapt by the impression that the Greeks’ struggle for independence had made in Europe, she arrived in Nauplion, temporary capital of the fledgeling Greek State. There she became involved in the political rivalries of the day, sided against Capodistrias and forged close ties with the Mavromichalis family. From 1831 she began to purchase large areas of land in Athens and Mt Penteli. 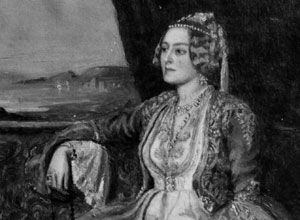 She settled permanently in Athens in 1837, after the untimely death of her daughter. The presence in the city of a personality such as the Duchess, with a fascinating past, a formidable fortune, a singular lifestyle and strange views, was an extraordinary event for Athenian society of the time. The Duchess commissioned the architect Stamatis Kleanthis to construct a total of six buildings, in Athens and its environs, including the Castello Rhododaphni on Penteli and the Villa Ilissia, her winter palace. Kleanthis, born at Velvendo, Macedonia, in 1802, studied at the Academy of Architecture in Berlin, under one of the most important architects of the age, Karl Friedrich Schinkel. In 1830 he came to Greece together with his German friend and colleague, Eduard Schaubert. One year later they began to design jointly the urban plan for the new city of Athens, in view of its possible establishment as capital of the new state. Their plan was approved by the Greek government in 1833 and, although it was never implemented, on account of opposition from owners of building plots, it is considered Kleanthis’s and Schaubert’s most significant work, since it is a characteristic example of the founding of a nineteenth-century city. Kleanthis was also involved with the building of many private houses for prosperous Greeks and foreigners. Indeed, in this period, several renowned architects, Greeks and foreigners, such as Lysandros Kaftantzoglou, Dimitrios Zezos, Leo von Klenze, Christian and Theophil Hansen, Griedrich von Gaertner, Wilhelm von Weiler and Ernst Ziller, had gravitated to Athens and were working on the construction of public and private buildings that shaped the architectural aspect of the capital. Building of the Villa Ilissia commenced in 1840, a short distance beyond the city’s boundaries and not far from the Royal Palace (the present Parliament building), which began to go up in 1836. The Villa Ilissia was located between the right bank of the River Ilissos, nowadays covered, and the highway that had been charted not long before, linking Athens with Kifissia. Kifissias Avenue, as Vasilissis Sophias Avenue was then called, quickly developed into one of the most beautiful boulevards in Athens, symbol of the capital’s Europeanization and lined with handsome public buildings as well as private mansions of pre-eminent members of Athenian society, all designed by leading architects of the time. The Villa Ilissia is actually a complex of buildings. The central building, the Duchess’s residence, comprises two storeys and a basement. Distinguished by simplicity and strict symmetry, its exterior is revetted with marble. On the north front, facing the courtyard and Lykavittos Hill, there are seven-arched porticoes on both storeys, while two projecting towers, accommodating the staircases, rise at the corners. On the south front, originally overlooking the Ilissos, there is a three-arched portico in the middle of the ground floor and a nine-arched one on the upper storey. The few decorative elements, such as the wooden cantilevers of the roof, with the painted palmettes, do not detract from the building’s austere form. Narrow bands with relief decoration of schematic cruciform motifs function as string courses of both storeys, while at the same time emphasizing the horizontal articulation of the architectural features. The imposing central building stands at the far end of the forecourt, which is delimited by two low lateral wings intended for ancillary uses, and the gatehouse at the entrance. Carved on the arch of the marble vaulted entrance is the name of the complex: ILISSIA. The villa complex combines elements of Classicism, such as the predominance of the horizontal line and the low closed towers, with elements of Romanticism, such as the arcaded porticos on the two fronts of the central building and the overhanging roof, which heighten the alternation of light and shade. 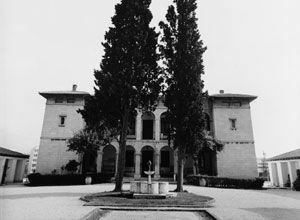 The Villa Ilissia was finished in 1848. The Duchess lived there until her death, in 1854. 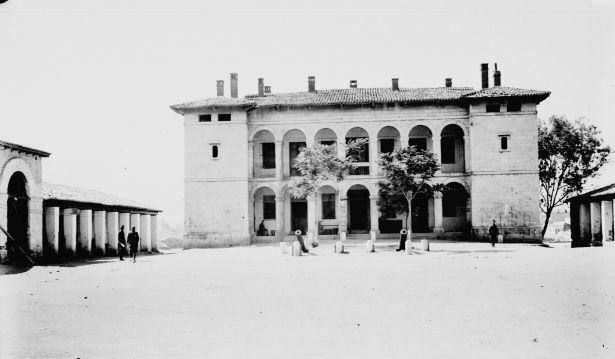 The complex later came into the possession of the Greek State and for three years housed the Officer Cadets’ Academy, and subsequently other military authorities. 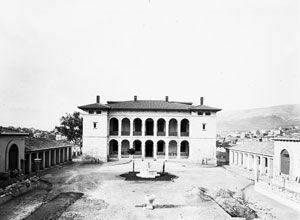 In 1926 the Villa Ilissia was granted as the premises of the Byzantine and Christian Museum. 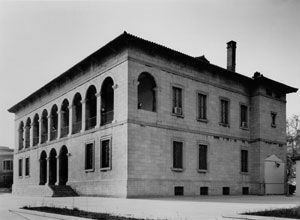 The exterior of the building was kept more or less as Kleanthis had designed it, while the interior was modified to meet the needs of its new use, to plans by the architect Aristotelis Zachos and in accordance with the museological concepts of the then Director of the Museum, Georgios Soteriou. 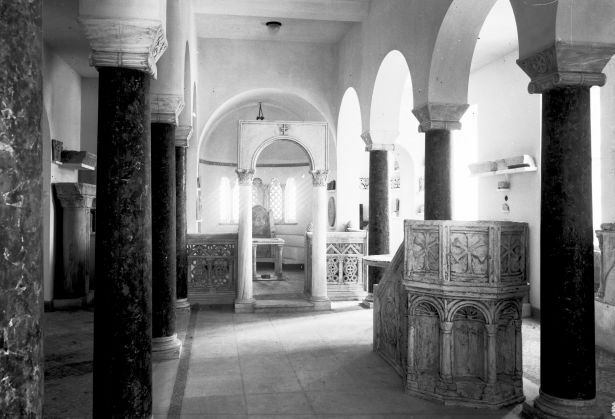 Major interventions were made in the ground floor, where three rooms were arranged as characteristic types of churches of the Early Christian, the Byzantine and the Postbyzantine period. 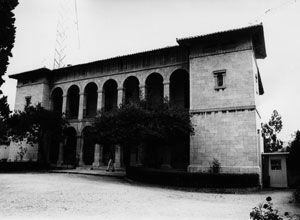 The courtyard was arranged to plans by the architect Kimon Laskaris. 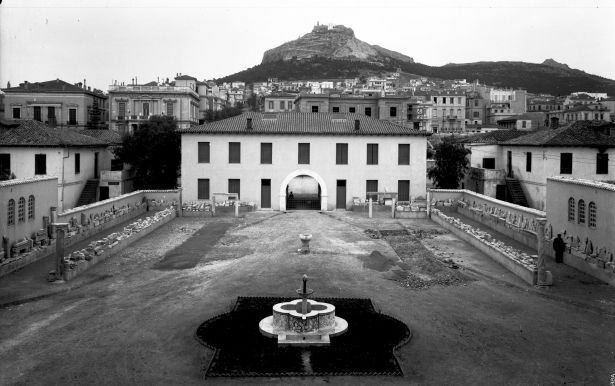 In 1930, when the Byzantine and Christian Museum opened the doors of its permanent home to the public, a new period in the history of the Villa Ilissia was inaugurated. In the minds of thousands of visitors, the mansion of the Duchess of Plaisance has become associated with its new use as a museum. Today the Byzantine and Christian Museum has completed the re-exhibition of its collections in the new museum, designed by the architect Manos Perrakis in the period 1987-1992 and already completed. The new museum is underground and developed on multiple levels below the building complex of the Duchess of Plaisance. Today, the main building of the Villa Ilissia opens its door to the public again after a much-needed and radical renovation. At the very heart of the Byzantine Museum once more, it now forms the hub of a culture park in the very centre of the city. The ground floor has been turned into the main visitor reception, meeting and information area; the room remodelled in the nineteen thirties to represent the interior of an Early Christian basilica has retained this form, and will host a permanent exhibition on the history of the Museum. The room opposite will be used for temporary exhibitions and other events, as will the upper storey, increasing thereby the amount of exhibition space available to the Museum. The central building of the Villa Ilissia, when it housed military service. View of Villa Ilissia complex. Gallery I in the ground floor, laid out as an Early Christian basilica. Portrait of Sophie de Marbois-Lebrun, Duchess of Plaisance (1785-1854). Unknown painter, oil, National Historical Museum. 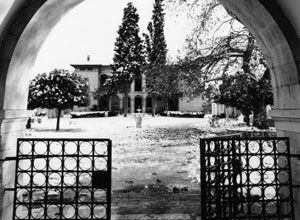 The entrance of the Villa Ilissia. The central building of the Villa Ilissia.